Compiling, analysing and disseminating data is a very important part of Parlour’s advocacy and activism, and has had a great impact. Now Gill Matthewson’s data analysis is available for you to use in making change in your own context. 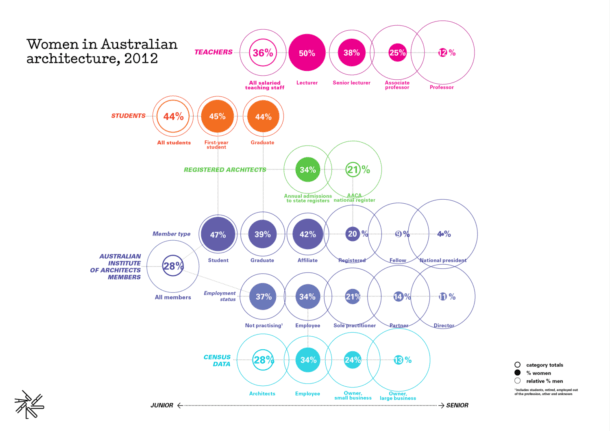 Parlour works with data to reveal the shape of the profession and the participation of women within it. This helps make women visible, while also pointing to structural problems that must be addressed. Dr Gill Matthewson leads Parlour’s statistical analysis has now prepared an overview of the data on women’s participation in the profession and why it matters. We provide this summary to assist others advocating for gender equity within their own professional context. Print it out, pass it around, use it in presentations as you advocate for gender equity in architecture. Download Numbers in a Nutshell here.. The data from the 2016 Census will be available in late 2017. We will update the analysis as soon as this information is available. This will take time and money – if you are in a position to support Parlour’s ongoing analysis and advocacy please donate and become a Parlour Friend! NOTE: This PDF was updated on 22 June, 2017. Previous postConfidence is the key Next postEOFY – a great time to donate to Parlour! Isnt another reason that women at the age of 25-29 would leave the profession is that they are choosing to start a family? A lack of flexible options for work schedules surely aren’t exclusive to women? The starting of families does indeed explain some of the loss of women into their thirties, coupled with the wider societal expectation that women should shoulder the bulk of child care. But it doesn’t explain all. And no, the problem of the lack of flexible work options doesn’t just affect women. Parlour has always argued that making the work environment better for women in this respect will also make it better for men. I interviewed quite a number of men who were wanting reduced or flexible hours mainly to do with child care. But there are reasons other than childcare why people might need or want flexibility, and those too should be on the table.